Today’s story is no ordinary tale. It is the story of how two otherwise ordinary men became extraordinary. 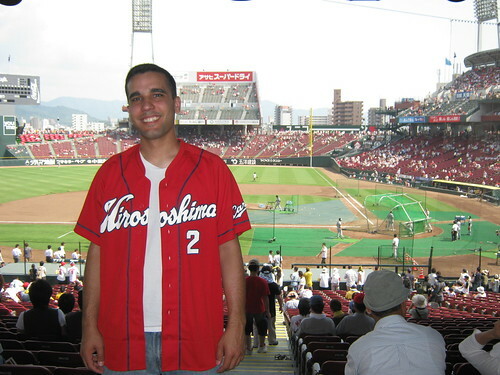 This is the story of how Dave and I overcame obstacles and became the Official Japanball Vice-Presidents of Diplomatic Affairs (and then went to a baseball game). It started on a day like any other. Dave and I got up as usual for our early morning brief to take a tour of the local sights. 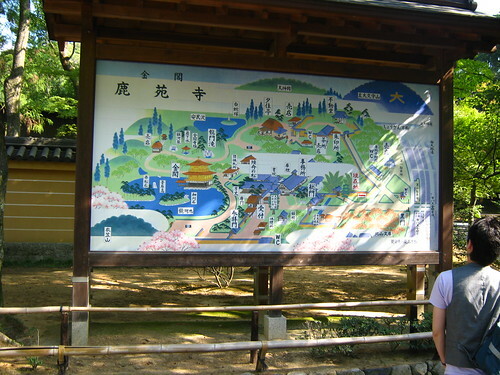 On the agenda were Ryōan-ji and Kinkaku-ji, two Buddhist temples in the area. During the briefing I started to feel something getting really hot in my pockets. 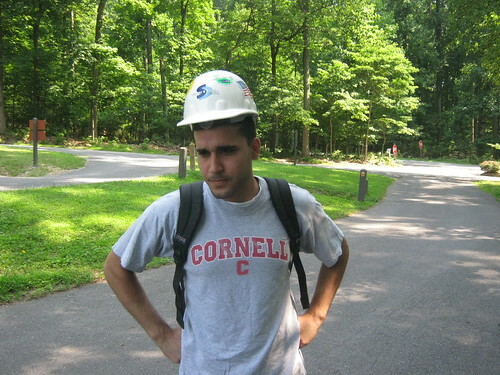 Alarmed, I started trying to dig through my pockets and felt my change was all really hot and so were my batteries. I successfully pulled all of that out of my pocket and learned an important lesson: Never put your batteries in the same pocket as your coins, lest they complete some sort of bizarre short circuit and set your pants on fire or explode. From then on, I kept my change and my batteries in opposite pockets. Today’s quick tour of Kyoto was to include a trip to the famous zen rock garden at Ryōan-ji and a visit to the Golden Temple Kinkaku-ji. Dave and I jumped into a cab together and started our day of fun. Much like we love to speak whatever broken, accented version of Japanese to impress, a lot of Japanese service workers will try their hand at speaking English to Westerners. Dave and I were greeted by a friendly taxi driver that morning who wished us a hearty “Good Morning!” and who also asked if we were “brothers.” We instantly thought this cab driver was way cool. We thought he was even cooler when he began taking us down side roads to get to the temple faster, even though we almost hit another car on one of the narrow roads. Because Dave and I arrived at Ryōan-ji rather early, the rock garden was almost completely empty except for our tour group. 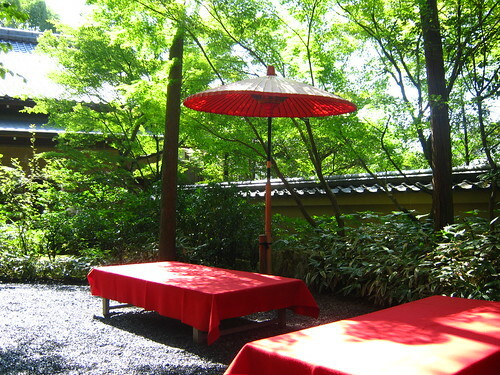 This was a great thing, since it allowed the few of us there to really sit and think about the zen of the rock garden. After a few minutes of viewing and introspection, I began exploring the temple. 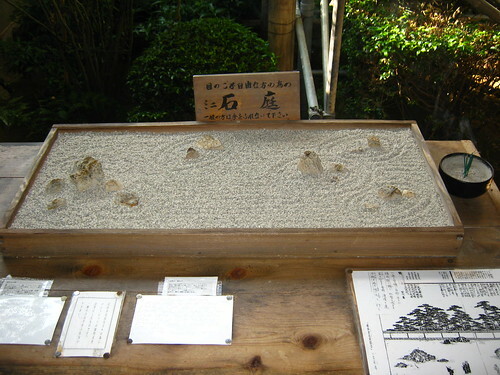 A mini version of the zen rock garden at Ryōan-ji . From it you can gain mini-enlightenment. It was pretty small and it seemed to have all the things I was used to seeing in anime renditions of Buddhist temples. 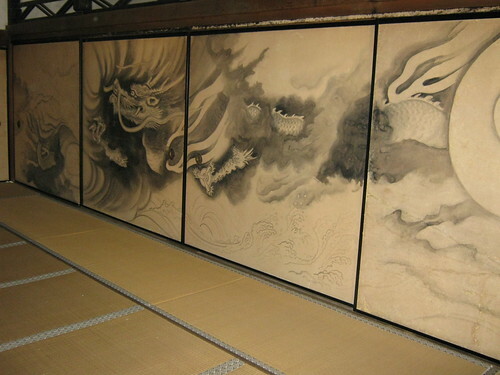 One particular highlight was the cool dragon art on the wall inside one of the rooms. Dragon mural on the temple wall. After Ryōan-ji, we hailed yet another cab to get over to Kinkaku-ji. The driver who pulled up was a huge, jolly-looking Japanese fellow who Dave and I named our new favorite taxi driver after he dropped us off and yelled “HAVE A NICE DAY!” The day was just getting better and better. We arrived at Kinkaku-ji about 15 minutes before it opened, so we had to wait a bit before we could go in. This time the crowds were much larger and several groups of students began arriving and queuing behind our group. Right before 0900 the doorman let in some photographers and what looked like a reporter and then opened the huge gates to admit the rest of us. The Golden Temple is a tremendously beautiful building that sits alongside a pond providing great reflections in the dark. Dave and I marveled at the beauty of it and continued around the complex. I picked up a charm to bless my mother in her old age (her birthday was coming in a few days) and we eventually came upon a tea garden. Since admission was a mere ¥500, Dave and I paid and chose to eat outside. 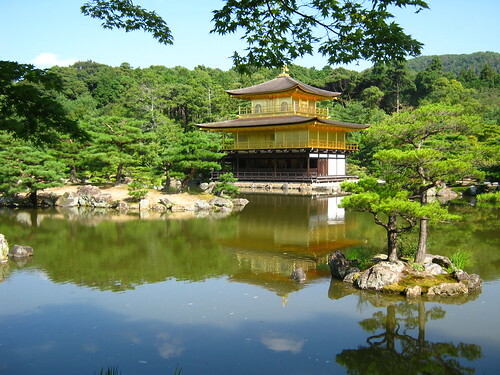 Kinkaku-ji is beautiful in the morning sun. This proved troublesome, since the inside appeared to be an “eat on the floor” style place, but the outside was lined with gravel that had just been watered and had tables (or benches?) 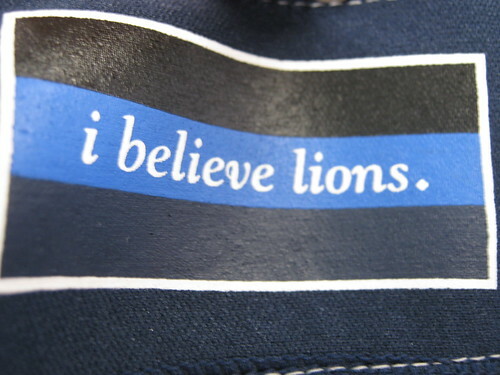 with cloths over them. Not wanting to offend, Dave and I stood around looking confused for a bit until a waitress indicated that we were to sit on the benches/tables. 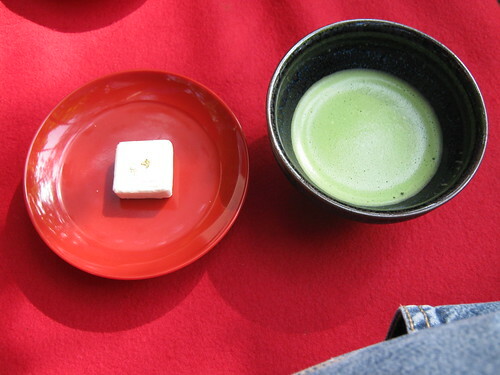 Soon after sitting and watching the crowds pass by us, she returned with a tray containing a bowl of strong green tea and a sugar cake for both of us. 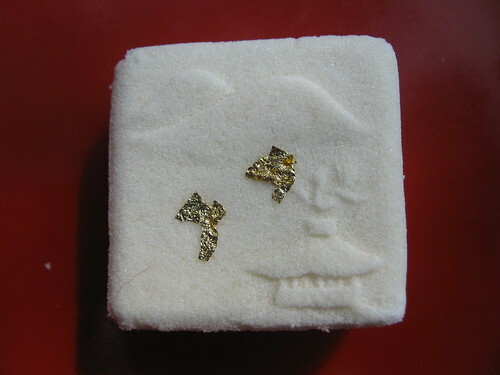 The cake was beautifully detailed with a rendition of the temple and the mountains in the background and while the tea looked rather brine-y, it was also delicious. The tea might not look good, but it's fantastic. Our quick tour done, it was time for us to head back to the hotel and catch the Shinkansen bound for Hiroshima to see the Carp game scheduled for that afternoon. Our taxi driver on the way back had with him a flipbook containing English phrases to point out landmark shrines and vistas along the way. We wondered why he didn’t seem to talk and he held up a sign that said cancer of the larynx. His notecards were a great way to view the sights and he became our official favorite taxi driver of the day, yet again. Once we arrived back in the hotel, we told Bob about our taxi driver adventures. At that moment Bob was struck with inspiration and he named Dave and I the Official Japanball Vice-Presidents of Diplomatic Affairs, since we seemed to be getting along great with random Japanese citizens and were overall friendly guys. Dave and I were humbled by this appointment, but vowed to do our best to make Bob proud. One long train ride took us almost to the southwestern tip of Honshū and we dropped off our bags before walking toward the ballpark. 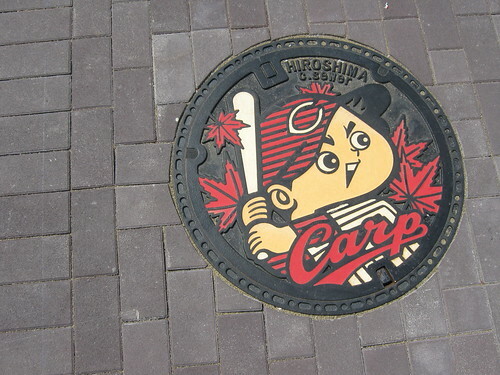 One thing I noticed immediately upon arriving in Hiroshima was that the area seems to really love their baseball team. 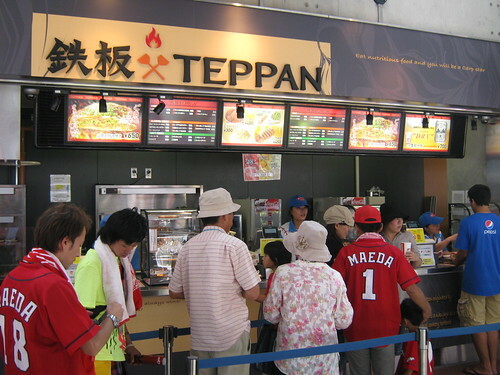 Even within the train station I could see banners for the Carp and the path to the ballpark was lined with Carp-themed banners while fans decked out in bright red Carp jerseys streamed toward the stadium. 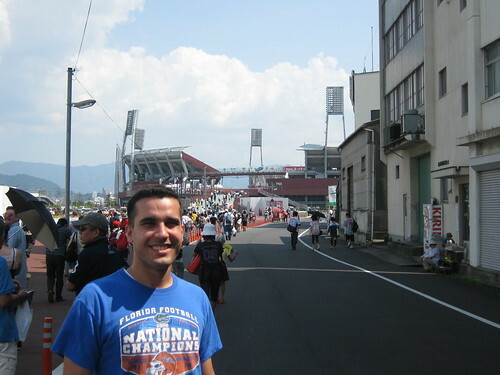 As an alumnus of the Cornell Big Red, I felt like I was at home among all the red and I officially found my favorite team in the NPB. I may have come out here rooting for the Dragons, but there’s something about that bright red that calls out to me. Carp fans were among the best I'd seen so far. In the distance is their new ballpark. 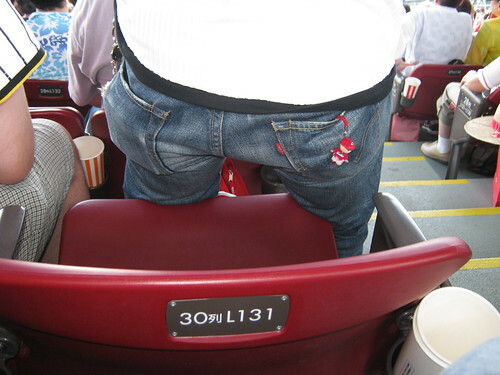 Mazda Stadium, the home of the Hiroshima Carp, was opened just this year in April, and it really shows. Everything about the ballpark just looks brand new and very nice and it also happens to be the most “Western” seeming ballpark. just based on the way it seems to synergize with the surrounding city. The open air concourses and the fact that you could see the field from almost anywhere in the park make it really seem like a Populous designed stadium. Take from that what you will, but it’s just a beautiful ballpark that shouldn’t be missed. The concessions are all new and seem very nice and they also have two huge gift shops packed to the gills with fans and neat merchandise. 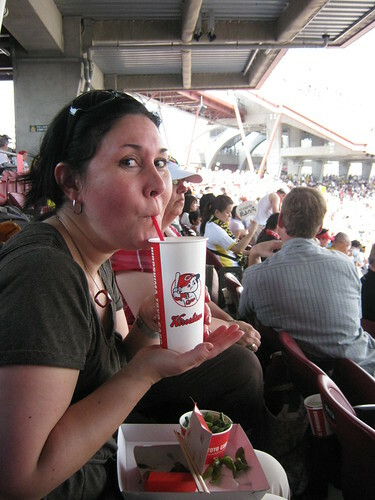 The official full name is Mazda Zoom-Zoom Stadium Hiroshima, but I will never call it that again. 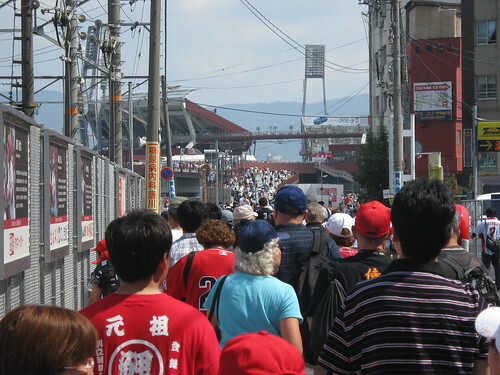 Carp fans just seemed very spirited to me compared to the Giants and Buffaloes fans we’d seen. They sold out the 32,000 person ballpark and there were many more people in SRO seats trying to catch a view of the game too. 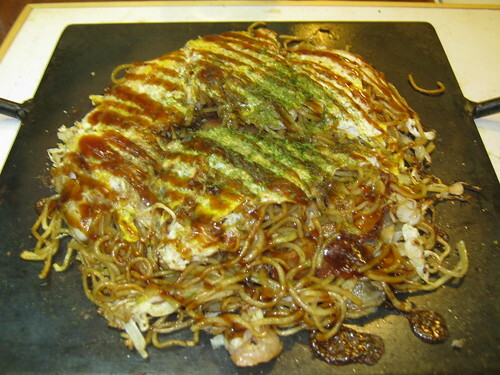 Vendors sold all sorts of great food, including local specialties like okanomiyake (prepared the Hiroshima way) and Japanese classics like takoyaki. 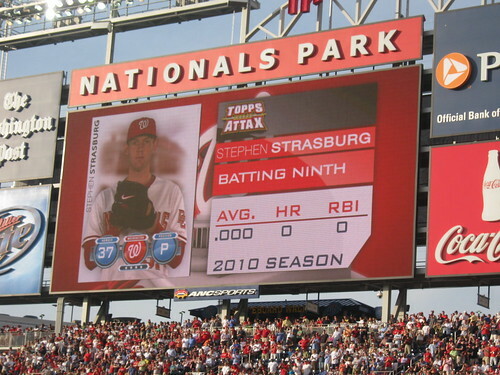 Like the other ballparks, they also sold hamburgers, hot dogs, and fries to really get the baseball game juices flowing. Dave buying some okonomiyake at a ballpark vendor. 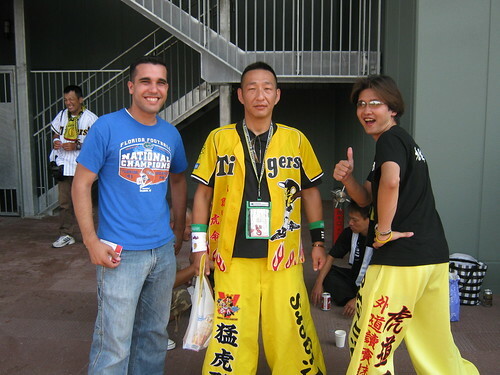 The opponents that day were the Hanshin Tigers, a team referred to as the “soul of Japanese baseball” by many due to their extremely fervent fanbase. Tigers fans showed up in droves and seemed to account for about half of the park’s attendance that day. The amount of gear and apparel they all wore to represent was astounding. I really can’t wait to see them in their home town later on this tour. Tigers fans really know how to root for a team. There is a very Japanese element to fans of Japanese teams that is truly incredible. They don’t just go to games, they go to games. Fans show up with bags full of gear, from jerseys, shirts, and caps to fans, cell phone straps, and what I’m calling boom sticks. Those boom sticks are team-branded plastic, bat-shaped noisemakers that they bang together instead of clapping during cheers and the like. Like I said before, they start cheering slightly before the game and they don’t stop for one second until the final pitch is thrown in the 9th. That’s slightly inaccurate, they do pause at inning halves and allow the other team to take over cheering for their batters, but they will still cheer for great pitching and plays on the field. The game itself was a super exciting affair. Before the game I picked up my customary jersey, but this time I had to pick a number, since they only offered player jerseys. Numbers 5 and 16 were sold out, so I went with #2, Akihiro Higashide and boy am I glad that I did. The star of the team is probably #5, Kenta Kurihara, but Higashide is probably the second or third best player on the team and he was responsible for the only Carp run of the day. Despite being home team kryponite, I like to think that purchasing this Akihiro Higashide jersey helped him play as well as he did that day. 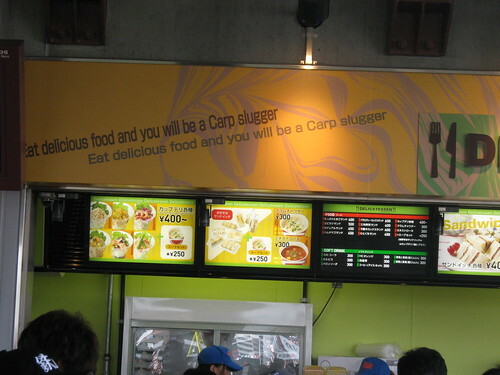 After the Carp lost 3-1, Dave and I felt that we were, in fact, terrible luck for home teams. We vowed to see how the rest of the games on the trip went to see if the wins fell along a more predictable statistical path, but after a tie (that only happened because we left) and two losses, we were convinced. 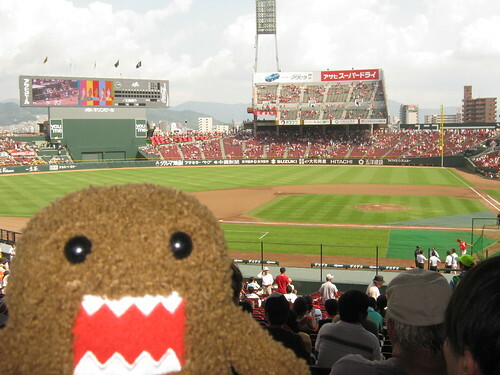 Domo-kun loves the Carp too! I totally forgot to mention, but Dave and I were adopted around that day by Susan. Our new mother chose not to have children, but since we were already grown up, self-sufficient, and such nice boys, she decided that she would take us in. Since Susan was tons of fun, Dave and I agreed and our second family was born. The okanomiyake we ended up eating in the deserted hotel restaurant. Our day was done, but we had plenty of sights to see the next day, including the Hiroshima Peace Memorial.